So you’ve been tasked with improving productivity on the invoicing front. You’ve analyzed your systems and resources – and determined your budget and over-stretched teams offer little upside. You’ve explored the daunting path of system consolidation – too much time, not enough resources. So now what do you do? You shift your focus from the invoicing mechanics to the resulting invoicing experience. And open up a slew of hidden costs that are draining your productivity and profits. What’s the biggest hidden billing cost? The dreaded inquiry. For most usage-based service providers, these invoice-related questions represent more than 80% of all customer inquiries. Why so many questions about invoices? As you know, from an insider’s point of view, invoicing has become quite convoluted over the past few years. The speed at which your company is bringing new products and services to market far exceeds the pace at which your invoicing is evolving. The constant flux of acquired and legacy systems, ever-expanding product catalogs and new charging models aren’t just a headache for your billing and finance teams. It’s nearly impossible for customers to understand their invoices without a billing expert’s translation. The majority of invoice inquiries can be summed up in one quote: “I don’t understand my charges.” It’s not questions about payments or adjustment requests. It’s questions about what this charge is for, why was I charged this amount, and how I can be sure my charges are accurate. As you’ve witnessed, these seemingly simple inquiries can quickly snowball into complex investigations. Your support and finance teams don’t have a centralized place to find the answer. Ironically, they have to navigate through varying systems and data types –just like your customers. Depending on the complexity of the customers’ portfolio, this can take hours or even weeks to get to a point of resolution. And of course, that comes with a cost. 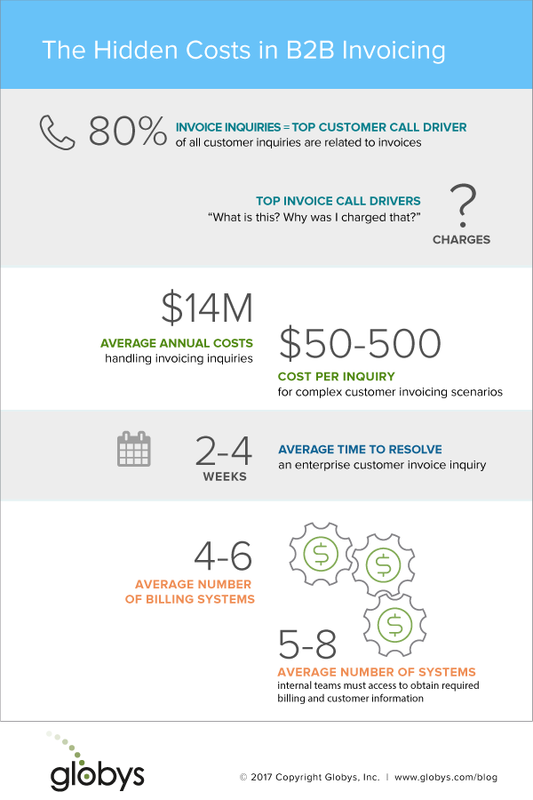 Some companies report upwards of $500 to resolve invoice inquiries from enterprise customers. Multiply this across thousands of customers, most of whom are receiving 10+ invoices per month, and you can see how this quickly becomes a multi-million dollar problem. So what’s the silver lining? This hidden cost, as well as others depicted in the infographic below, aren’t a direct tie to the nuts and bolts of your billing. Customers don’t care about the mess that lurks behind your company’s walls and servers. They care about getting the information they need to process invoices and payments as efficiently and accurately as possible. And this is where your productivity play comes to fruition. Outside of your products and services themselves, invoicing is the most important interaction your company has with its customers. And with importance, comes opportunity. Check out the Globys Suite to see how suppliers are reducing these overhead expenses while providing a better invoicing experience for their customers.